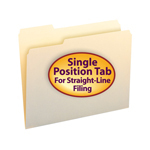 The Smead Straight-Line Filing method was developed to help you file and find files faster and easier. Straight-Line Filing is based on the simple fact that your eyes scan information much faster when moving in a straight line versus looking back and forth. A good example of the Straight-Line concept can be seen in the way that names are organized in a phone book. Finding a name in a phone book is easy because the names are arranged in columns so your eyes scan them in a straight line. If you had to look back and forth across the page, finding a name would be more difficult and time consuming. The same concept holds true when setting up your filing system. By using folders with tabs in the same position, you can quickly scan file headings to find the file you need, which dramatically reduces the time you spend looking for files. 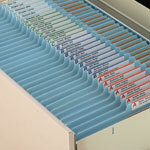 Many file drawers are arranged using folders with tabs in assorted positions. This system of organization forces you to look back and forth across the file drawer to find the folder you need. This takes longer and is more frustrating when you’re looking for that important file. Straight-Line Filing changes all that. By using file folders with tabs all in one position, your eyes can quickly scan a large number of folder headings to find the file you need with minimal effort. When using assorted tab folders, adding new files disrupts the tab position sequence, making your system look disorganized. This makes scanning file headings even more frustrating since the tabs no longer follow any order. With Straight-Line Filing, adding new records does not disrupt the tab sequence, keeping the system organized and performing as well as the first day you set it up. 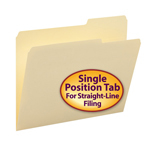 Straight-Line Filing is not just for manila folders. 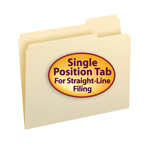 Whether you file small amounts of records in folders, or large amounts of paper in file pockets, Smead has a single tab position product to fit your filing needs. Just be sure the tabs or label headings are in the same position on all of your files. Adding color to your Straight-Line Filing system speeds filing and retrieval time and helps eliminate lost files. 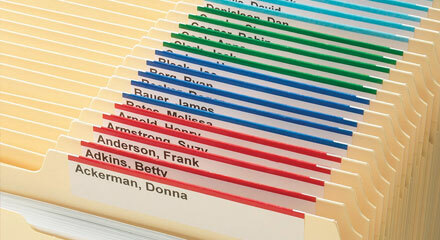 Color coding has been used for many years in medical and dental offices that manage very large numbers of files. Studies have proven that people identify colors far more quickly than reading words. Color breaks your filing system into smaller sections that quickly bring you within a few folders of the one you are looking for. You quickly learn to associate colors with letters. Instinctively, you first look for the color before you read any of the label text. Setting up your system using Straight-Line Filing will start to pay off immediately. 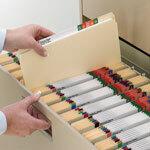 80 percent of the cost of your filing system is the personnel time spent filing and retrieving documents. Not only will the system save money, it will also make you feel better and look more professional when you can quickly find what you need. Like this article? You may also like these. Invalid email address. Please enter a valid one.